Sorry, but no official profile of Neo Vamdemon Darkness Mode (Shoutmon) has been added yet. Anime/Manga Digimon Xros Wars: "Don't Die, Greymon! 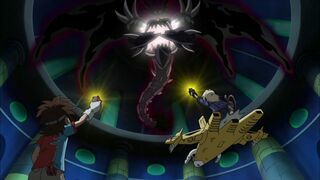 The Birth of Shoutmon DX"
↑ Digimon Xros Wars: "Don't Die, Greymon! The Birth of Shoutmon DX"
This page was last modified on 3 December 2016, at 16:37.